Fujitsu Laboratories Ltd. today announced that it has signed an agreement with the City of Koriyama in Fukushima Prefecture to cooperate on an operational trial of a sensing system to detect early signs of overflows in sewer systems. The trial is to begin today. 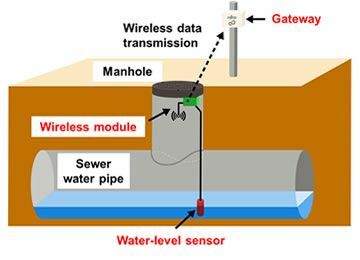 In this operational trial, sensors that can detect water levels will be attached to three locations in manholes to constantly monitor wastewater levels. The trial is intended to validate the use of a sensing system for tracking conditions inside the wastewater system, which are used for timing the opening or closing of sluices and activation of wastewater pumps. Water-level data will be aggregated at the Fukushima datacenter of F-COM Co., Ltd.(1) in a data collection system developed by Fujitsu Laboratories and F-COM. The results of this trial will help the City of Koriyama plan improvements to its wastewater system more effectively and design a better system in the future. For Fujitsu Laboratories, this trial promises to produce data that can be used in other ways, including designing better evacuation routes. Koriyama has been especially vulnerable to flooding caused by intense, localized rainfall. Over a 27-year period from 1986 to 2013, it has experienced 15 flood events within its city limits. The city therefore formulated a "Nine-Year Flash-Flood Plan," registered in September 2014, with the goal of reducing the impact of flooding on its residential and downtown areas. While the city has been working to establish measures to counteract the impact of downpours, it still does not have the ability to track in real time water levels throughout the wide area covered by its sewer infrastructure. For its part, Fujitsu Laboratories has previously developed a technology that can identify signs of sewer system overflows, announced February 10, 2015(2) , in order to reduce the impact of heavy rains and flash floods in cities. This technology uses water-level detecting sensors attached to manholes to measure water levels for accurately detecting signs of overflow. Validate the performance and functionality of sewer water level monitoring, test long-term operational stability, and validate the water-level forecasting algorithm based on measured sewer water data. In this operational trial, conducted jointly with the City of Koriyama, water-level sensors will be attached to at least three manhole or grate(3) locations along the Ochiaibori Storm Drain. The following analyses will be conducted using sewer water level data gathered in real time. Constant monitoring of sewer water levels to visualize the internal state of the wastewater system, which had previously been difficult. Using information such as changes in water levels obtained through this study, time the opening or closing of sluices and activation of wastewater pumps. Sewer water data will be collected in a cloud environment built by Fujitsu Laboratories and F-COM, and stored at F-COM's Fukushima datacenter. F-COM's field system engineers will be in charge of maintenance in the field during the trial. The results of this operational trial will help the City of Koriyama plan more effective improvements to its sewer system and improve designs in the future. Fujitsu Laboratories will consider how to use this sensing data in other ways, such as in the design of evacuation routes.